The following is a guest post by Robyn Hussa Farrell, MFA, E-RYT. This list is excerpted from Mental Fitness’s 60-hour certification program for educators who wish to learn how to teach mindfulness in the classroom setting. For details or more information, please feel free to email the author at rfarrell[at]mentalfitnessinc[dot]org. Because of recent research like The Adverse Childhood Experiences Study, creating a compassionate classroom is becoming more the norm in the education community. 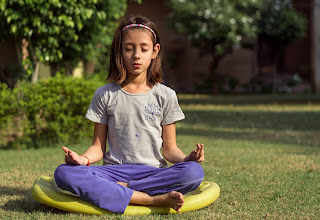 It’s particularly important when teaching yoga and mindfulness, as there are many potential triggers when students are meditating or when they’re engaged in certain physical postures or breathing activities. Here are eight strategies for safely implementing yoga and mindfulness exercises from a trauma-aware perspective. 1. Assume that students are the experts on their own trauma. No matter how much training or expertise you have, the student always knows what they have been through better than anyone. Create opportunities to listen and learn from their wisdom whenever possible. 2. Assume that 30%-50% of students (more if you are working in high-needs areas) have experienced Adverse Childhood Experiences (ACEs) and/or that they are currently struggling with a mental health disorder such as PTSD, depression, anxiety, or an eating or substance use disorder. In this way, you will take the steps to appropriately assist the children who may be struggling, while simultaneously providing effective instruction for the whole class. It is best practice to become aware of the mental health resources available in your school prior to leading mindfulness workshops. 3. Research shows that more than 50% of individuals may be under identified or not yet identified for struggling with a mental health disorder. Your work implementing mindfulness and yoga techniques may bring some of these conditions to the surface, so always have a plan in place to safely and discreetly connect the individual to an appropriate level of care. 4. Realize that all forms of trauma are valid. We sometimes break down trauma as small “t” or capital “T,” but regardless of the level, assume that the trauma has impacted the student in a very real way – to them. 5. Create a safe space for students. Consider developing a survey or other rubric to learn more about your students’ preferences. a. Candles, dim lights, etc. may be triggering. If you are dimming the lights for a mindfulness exercise, check in with the students and ask them if anyone would prefer you leave the lights on. I often have the students put their heads on the desk and raise their hand if they do not want lights off today, etc. b. If you are performing a guided meditation that uses “blue light” or another color, be sure that the color you are using is not triggering for students. (For example, they could associate colored light with police cars or ambulances, or could have had a traumatic experience in a room that was painted a particular color.) Check in with them to get feedback on color preferences. c. Select music that is not triggering. Various different styles of music may assist in putting students at ease. And various styles may be triggering. Consider finding non-religious, non-dogmatic, non-chanting styles of music. Those that are more neutral tend to offer greatest reward among trauma populations. I am happy to share a complete list with you - -just email me! d. For many students struggling with PTSD (and in some cases all students), certain positions or postures may be uncomfortable or triggering. If you are teaching yoga to those struggling with trauma, be mindful of postures such as lying on their backs with knees bent. I like to survey my students prior to teaching so that I learn if there are any positions (that they know about consciously) that could be triggering. e. Fabrics – sometimes soft and warm fabrics are particularly comforting to children who have struggled with trauma. Sometimes they are triggering. Again, the students are the experts, so find ways to check in and learn from them about these things whenever possible. a. We store grief and loss in our lungs. When we start leading pranayama / breathing exercises, any person may become dizzy, lightheaded or emotionally activated. For this reason, always begin teaching pranayama seated in a chair or close to the floor. For more information, read A Life Worth Breathing by Max Strom. b. We store stress and trauma in the hip and lower back area of our bodies. Similar to 6a. above, we want to be sure to assist in “opening” these areas while being mindful of the potential for heightened emotional experiences. For more information, read “The Body Keeps the Score” by Bessel Van der Kolk, MD. 7. Modify, Modify, Modify. Always provide “a way out” and / or modifications so that the student has options (for example, if a student doesn’t like journal writing, provide them with a second option for a technique). 8. Consider investigating models like Compassionate Schools and Trauma Sensitive Schools for the latest research and best practices on trauma-informed teaching. Robyn Hussa Farrell, MFA, is an E-RYT Certified Yoga Teacher and an accredited Continuing Education Provider through Yoga Alliance. She is Founder of 4 companies; including Mental Fitness-- an award-winning nonprofit organization that collaborates with national researchers in developmental psychology, resilience and neuroscience to create and deliver evidence-based mindfulness programs to K-12 schools.